Easy assembly and centric tension of the pipes for the welding process. 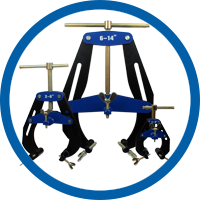 Our pipe welding clamps convince through low weight and are best before the useage on-site. On the construction site they are used for centering and tensioning pipes without length limitation, as well as pipe bends, flanges, tees, reducers and other fittings on pipes. 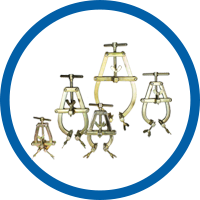 Due to its unique design, the quick release ensures that the clamping forces act uniformly around the pipe to be welded, since the distances between the clamping points are the same. This applies to all pipe dimensions within the ranges of the pipe quick-release clamps (1 "to 14"). The tensioning screws have stainless steel balls at their ends. This prevents scratching of the pipes and no corrosion occurs. Depending on the version, the arms are made of aluminum or steel, so that the clamping force corresponds to the requirements of all pipe dimensions within the range of the pipe quick-release clamp (27 - 355 mm) and wall thicknesses up to 15 mm. The quick pipe welding clamp can be used for all common materials such as construction steel, stainless steel, duplex, super duplex and titanium. The welding of pipe-to-pipe and pipe-to-pipe welding is easy with the pipe quick-release.